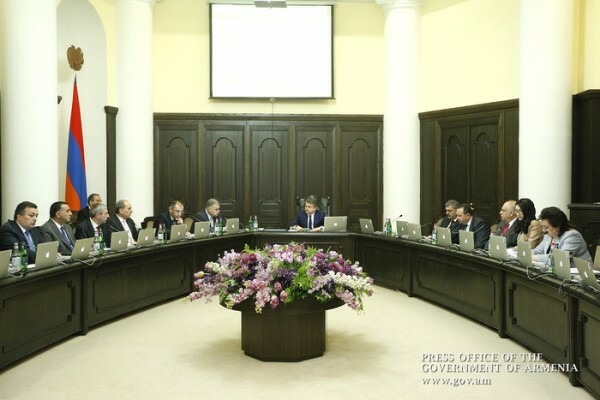 An extraordinary Cabinet sitting was held today, chaired by Prime Minister Karen Karapetyan. Minister-Chief of Government Staff David Haroutunyan noted that the discussions held with the National Assembly leadership led to the conclusion that the proposed extraordinary session agenda items might be discussed at the February 27 four-day session of the National Assembly and, therefore, it was suggested to cancel the aforementioned decree. Approving the draft law “On making amendments to RA Code on Administrative Offences,” the Government recognized its urgency. Minister of Justice Arpine Hovhannisyan reported that the adoption of the bill is dictated by the fact that two new articles and a number of other articles should be amended in the RA Code on Administrative Offences. In particular, question is of the refusal to substitute on the voting day those persons (specialists) or members of the precinct election of the Commission in case of non-fulfillment or improper fulfillment of their duties servicing the technical device provided to the precinct election commission that performs the registration of voters. Also, established are the bodies authorized to draw up protocols on administrative violations on these cases and subject to administrative responsibility for administrative offenses mentioned. It is also envisaged that the works to these offenses will be investigated within one month. The bill will be submitted to the National Assembly in the prescribed manner.